It is a record breaking day in the Swiss Franc. 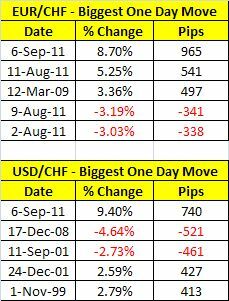 Here’s a table comparing the biggest one day moves in EUR/CHF and USD/CHF since the inception of the euro in 1999. The SNB put a floor under the Swiss Franc by saying they will do all that they can to keep EUR/CHF above 1.20. Based upon the sharp moves today -- the market clearly cares.